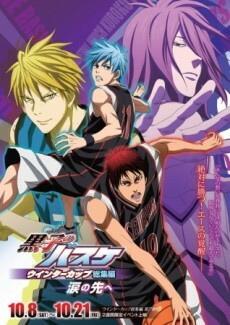 Second of three compilation films of the Kuroko no Basket franchise. Seirin faces off with Yosen in the quarter finals of the Winter Cup. Facing Yosen’s impenetrable defense with Murasakibara at its center, Kuroko manages to shoot his first point. Meanwhile, the ace battle between Kagami and Himuro also heats up. An intense battle is held until the very end. Next, Seirin faces off with Kaijo in the semi finals. Cautious of Kaijo's ace, Kise, and his Perfect Copy ability, Seirin works fast and hard to take the lead. Kise hurts his leg and is benched, so Seirin thinks they now have their chance, but then Kaijo shows them exactly what they can do even without Kise.